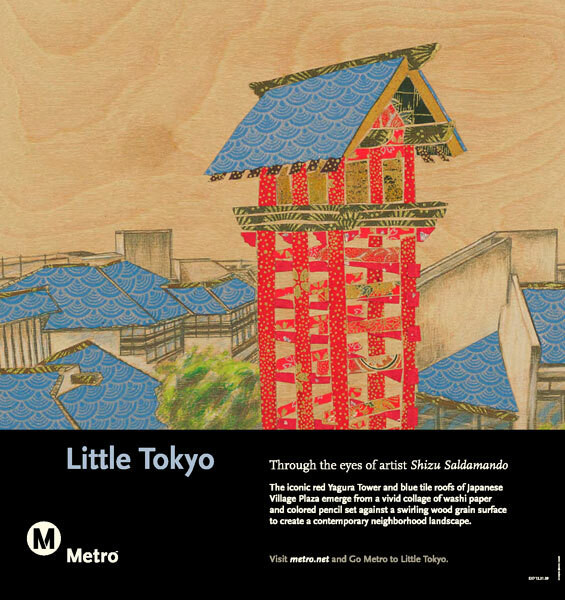 Little Tokyo by Shizu Saldamando. Washi Paper, Colored Pencil, on Wood Panel. In so many ways, despite all it has going for it, Los Angeles is an ugly city. I blame this on the fact that it has been scaled and arranged to accommodate the all-mighty automobile. The Los Angeles region’s freeways, while impressive in their sheer immensity and ubiquity (and sometimes, their jaw-dropping verticality), are not what you’d call beautiful. They are, in the end, endless stretches of concrete and asphalt struggling to move as many vehicles as possible as quickly as possible. With a mission like that, and over seven million vehicles to push through each day, the freeways have little option but to be strictly utilitarian. Off the freeways is not much better. The surface streets have the same mission, but must also serve the automobile’s other needs. So our roadsides — often encouraged by lax zoning laws — are dotted with gas stations, car washes, smog checks, lube shops, parking lots, drive-thrus, and all the other elements needed to make cars happy. Again, these might have a certain car-culture charm to them, but their cookie-cutter construction and utilitarian blandness makes it difficult to extract beauty, and more importantly, a true sense of place out of them. Transit, on the other hand, is scaled to the human being. This fact alone means there’s a chance for beauty and a chance to create a sense of place – a place for humans, not cars. This is most obvious at Metro Rail stations, where architecture and art combine to create visually stimulating places that leave a lasting impression on transit riders. Love it or hate it, there no denying that the Hollywood/Western Red Line Station has a lot more personality and impact than any on-ramp on the 101. They both serve a functional purpose, but one is a place (one you might be proud to show a visitor from out of town) while the other is just a tool. Rail stations aren’t the only chance transit offers for great place making. A transit vehicles can become a great place as well. Like a transit station, park, library, or museum, transit vehicles are civic spaces and thus can define our city. Sure, transit vehicles travel on the same bland roadways and freeways that private automobiles travel on, but transit vehicles can cater to humans while the road must cater to the vehicle. Because of this, transit vehicles can be rolling art museums. If you’ve ridden Metro buses or rail before, there’s no doubt you’ve seen art. Metro Creative Services has commissioned 19 local artists so far to create posters of various Metro destinations that adorn the bus and rail vehicles systemwide. The newest poster in the series, a washi paper and colored pencil collage of the Japanese Village Plaza in Little Tokyo by local artist Shizu Saldamando, is a great example of the power of public transportation to link art, beauty, and place. You are unlikely to see anything like this outside of a museum or gallery. Certainly not on L.A.’s roadways or freeways. The best you can hope for there are billboard advertisements. That’s not to say that Metro vehicles or stations are ad-free places, because they aren’t (Metro struggles for money so every bit counts), but alongside the advertisements (which unlike billboards are human scaled) you’ll find these great pieces of local art celebrating great places. Not only does Shizu’s piece communicate a sense of humanity in a sea of commerce and utilitarian function , it also celebrates and informs us of another great place – Little Tokyo. To me that’s the perfect melding of form and function, something that is impossible in a car on the freeway. Here you have a mode of transportation that has become of a place because of art, and that art is informing you of other great places you can get to on that mode of transportation. This is why I love public transportation! Of course, there are people who will say that the buses and trains are a mess, covered in graffiti and littered with trash, and that this negates any attempts to pretty things up with art. And on some level, I agree, no amount of art can beautify something that is at its core ugly, but I don’t think the transit system is ugly at its core. I think there is a cultural attitude, especially in Los Angeles, that says public transit can’t be beautiful, that it has no value as a great place. But I believe Metro’s investments in local artists like Shizu Saldamando is proof that they disagree with that assertion. By making the transit system a place, rather than just a tool, we can change that cultural attitude and have public transit receive the same respect from its users and providers that other great civic places receive. Because really, who wants to graffiti over something beautiful as Shizu’s poster? Exciting new video of Eastside Gold Line!